Pistachio Crusted Fish with Lemon Dill Aioli is an easy restaurant-quality meal that’s perfect for date night and it’s ready in 30 minutes! Whenever my husband and I have fish at home, I am a very happy girl! I’m sure it seems like one of those things that shouldn’t be much of a problem for someone who cooks for a living, right? Well, having fish for dinner at home is something we have to plan because of my husband’s schedule and because it’s so perishable. I haven’t found many brands and types of frozen fish that I like so I generally opt for fresh. However, Australis Barramundi is the exception. Ever since doing a post for Australis several years ago, I always have a bag or two of this fish in the freezer. 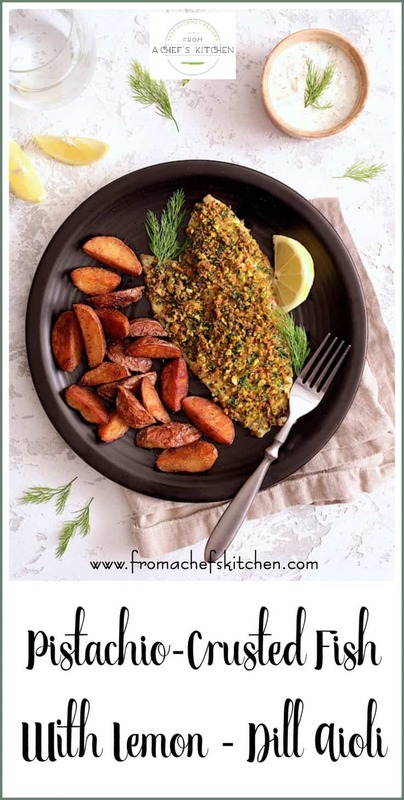 This Pistachio Crusted Fish recipe is not a sponsored post for them, I just really like this brand of frozen fish! Their barramundi is a very mild white flaky fish that tastes fresh. If you can’t find it where you are, use tilapia, sole or even catfish. 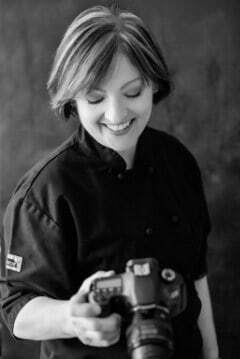 This recipe would also work with salmon, cod or Chilean sea bass. Just be sure to cook those fish a little longer as they’re thicker than the fish I used and those listed as substitutes. Prepare a baking dish by brushing with olive oil then place the fish in the prepared dish. 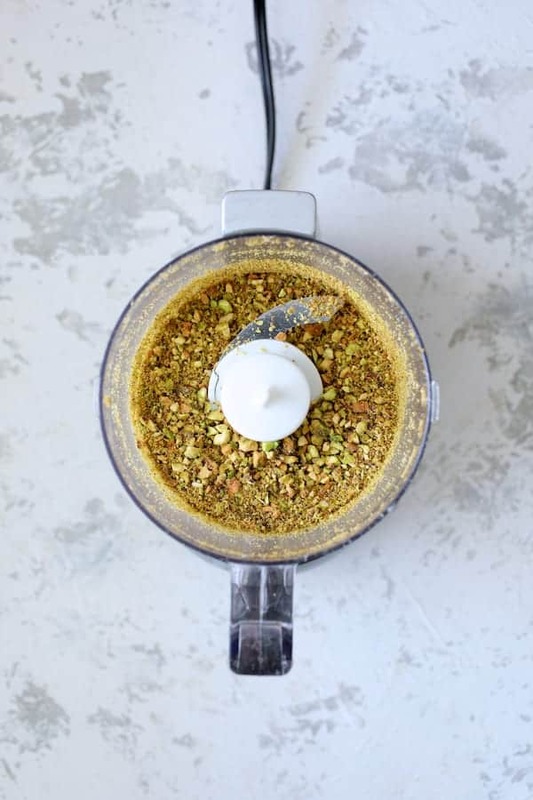 Place the pistachios in a mini food processor and process until coarsely ground. Brush the fish with a little mayonnaise so the pistachios adhere. Sprinkle the pistachio combination over the fish. While the fish is baking, stir together the ingredients for the Lemon Dill Aioli. Lemon Dill Aioli sounds fancy but an aioli is simply a garlicky mayonnaise. That’s IT! 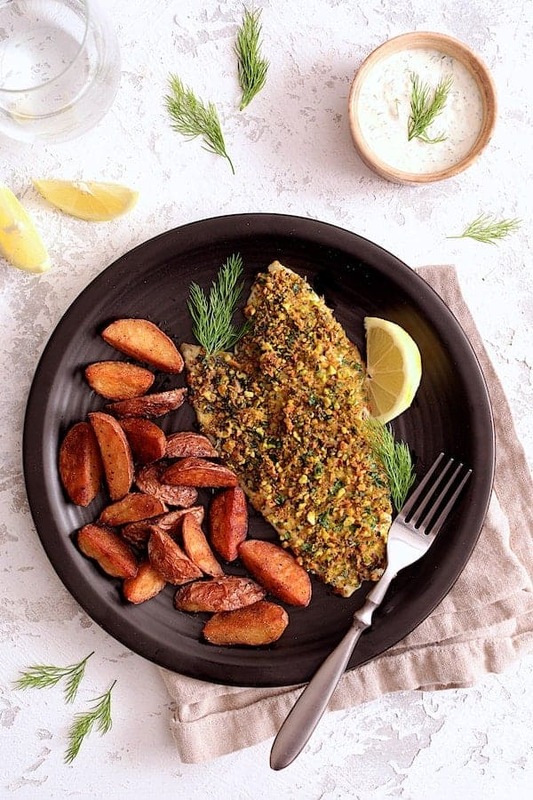 Pistachio Crusted Fish with Lemon Dill Aioli for a beautiful, restaurant-style dish at home! Perfect for date night yet easy enough for a weeknight! Serve with my Perfect Roasted Potato Wedges and a simple green vegetable on the side. 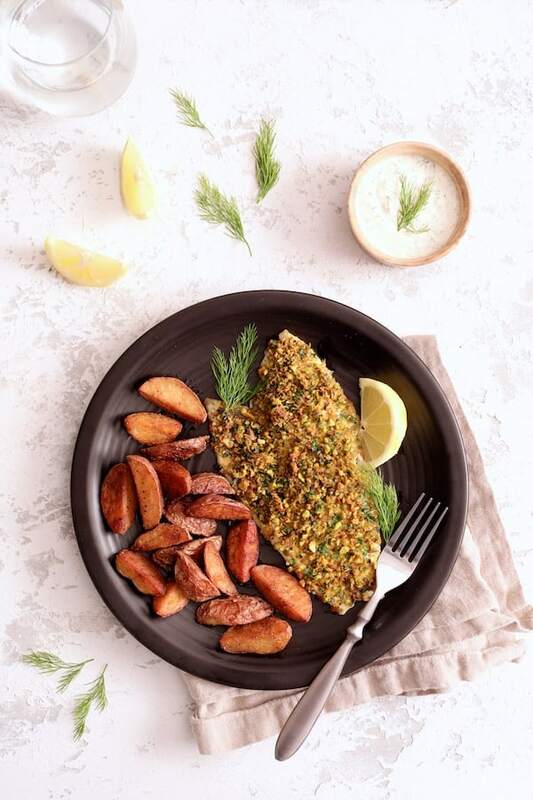 Pistachio Crusted Fish with Lemon Dill Aioli is an easy restaurant-quality meal that's perfect for date night and it's ready in 30 minutes! FISH: Preheat oven to 375 degrees. Lightly brush a baking dish with olive oil. Place the fish in the prepared baking dish. Brush the top of each piece of fish with mayonnaise. Sprinkle the pistachio mixture evenly over the top of each piece of fish. 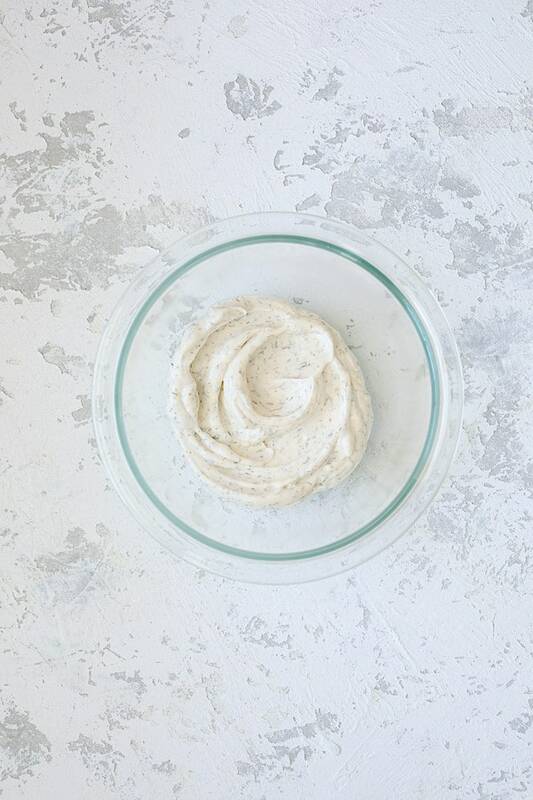 LEMON DILL AIOLI: Combine all ingredients in a small bowl. Serve with fish. I am in love with this recipe! I’m also in love with fish but because we are landlocked in Wisconsin, we have very limited access fresh seafood and so often times have to make due with what is available in the grocer’s freezer. I will definitely look for Australis Barramundi , based on your recommendation. Kudos for creating such a beautiful, healthy, and delicious looking fish entree, it’s proof that you don’t need to spend all day in the kitchen for something so good! I have so much more I could add about what I love about this recipe, your use of pistachios, the aioli, and of course the 30-minute prep to table time – what’s not to love?! Hi, Dan, Thanks so much! I’m from central Wisconsin so I know all about the fish situation there! It’s pretty much bluegills, crappie, perch or walleye. Do try the Australis Barramundi; it’s a good, dependable non-fishy mild fish to keep in the freezer. Thanks again and gosh…. you have me missing a good old Wisconsin Friday night fish fry!